Retallack consists of 900 acres of undulating red loam to light clay country with some small ridges which were originally timbered with Murray pine, Kurrajong and Grey box. Retallack still carries some small areas of original timber and many shade trees of the above species. An extensive soil conservation program was carried out in the 70's before the property was subdivided into 26 paddocks with lane ways making it ideal for a stud sheep operation. All paddocks are watered by troughs with a big majority also with dams. Two large dams provide a water supply to stock, gardens, lawns at the homestead, sheep yards and selling complex. 8 acres of spray irrigation complements the operation. Retallack's 18" rainfall is ideal for the production of sound, healthy livestock. For many years Retallack's policy of an annual 100 kgs per hectare programme of a superphosphate topdressing programme has been carried out with great results. Retallacks total grazing area has been sown down with clovers and ryegrasses. Native winter and summer grasses such as black grass and rabbits foot clovers are now a valuable grazing option in early summers. Retallack runs approx. 600 Border Leicester breeding ewes, which forms the only primary production enterprise. 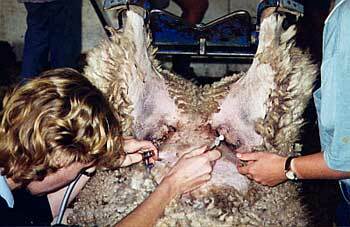 Ewes are joined either AI, embryo transfer or paddock mating in the first week of March. Pregancy testing is usually around the last week of June. These ewes are scanned into groups of early, late and dry, singles, twins or multiples. All dry ewes are culled. Lambing commences late July with the majority of lambs on the ground by mid September. Rams are removed by the end of April, with an end of September finish to lambing. All lambs are double tagged at birth, recording their mothers and spraying their navels with iodine thus reducing the risk of navel ill.
Lambmarking and vaccinating is at approx 4/5 weeks of age with Glanvac 6/1 + B.12+S, Scabby Guard and Guidair. A second vaccination is approx. 4 weeks after the initial dose with Glanvac 6/1. All sheep and lambs are shorn, drenched and dipped in early November. breeders disposed of at the Wagga Sheep Market, suitable CFA females catalogued for our summer production sale in February and the remaining stock retained at Retallack. All retained weaners after classing are weighed and muscle scanned by an accredited lamb plan accessor in late May. The earlier drop progeny are catalogued for our spring production sale with the later stock retained for the summer production sale. The selected CFA females are also available at this auction. Retallack use and recommend . .